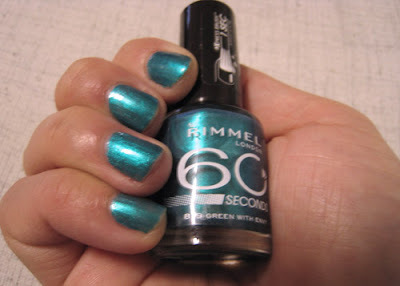 I was looking for some colours in my nails and picked this up at Priceline which currently has 20% off Rimmel products. 819 Green with Envy is a gorgeous pearlescent peacock green colour. The formula is very forgiving, you don't need to be the perfect polish painter and the colour will self level as it dries and is non streaky- perfect for clumsy people like me. 2 coats and you have a colour that is true to bottle.These polishes dry in no time which makes them are less prone to accidental marks and dents. Rimmel put these polishes out with a wide tapered flat brush which I personally found harder to use than normal brushes. Those with smaller and neater nail shapes than mine will probably find this makes application easier than traditional brushes as it can cover the whole nail in one stroke. The above photos were taken after 3 days of wear (with top coat) and they are still brilliantly shiny and fairly chip resistant. I'm impressed with its durability. Overall I really like Rimmel polishes, there is enough shades to choose from to keep you amused and are relatively cheap. Green with Envy is vibrant and looks stunning if you like wearing black or dark clothings (me at work most days). I wore this into the office this week and had so many compliments, from the ladies and the men, which was surprising as I'd thought that they never notice nail colours. Even Mr. Yoyo told me he liked it after he got over the fact it was green. Check them out next time when you pass the Rimmel counters and pick one up to try for yourself. Rating: 8.5/10 RRP A$7.95 at Priceline, Target and selected pharmacies. Disclosure: Mr. Yoyo is the man in my life. He likes to think he is the best and smartest boyfriend there ever is. He gets on my nerves most times and never listens to me even though he tells me he likes to "practice his listening face" when I'm around. Despite this, he gives me his undying support and I love him for it.